Today we took one last romp in central London. The weather was sunny and 81 degrees, so one must take advantage of that in this city! We quickly threw on clothes and took the boys to the Princess Diana Memorial Playground in Hyde Park. It has a lovely Peter Pan theme, with a big wooden pirate ship and all sorts of other enchanted spaces. We fortunately beat most of the crowd and the worst of the heat. After a ride on the carousel we hiked through the park to catch the #9 bus. 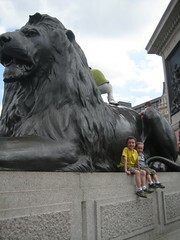 On the top we rode, enjoying the sights and getting off at Trafalgar Square, where the boys said a final goodbye to the enormous lions that "guard" it. A walk to Covent Garden took us to our favorite lunch spot - Belgo Central. Four pots of steamed mussels, frites for all and three ice creams later we left stuffed silly. A bit of shopping and busker-watching in the Covent Garden Market completed our trip, and the Picadilly tube line took us home again, happy and exhausted. It was a grand day. I think we all feel quite full and content with our British experience this year. So farewell London.......until we meet again. Thank you for letting us eavesdrop, spy and pretend you were ours for a year. And for those of you who loved and welcomed us, we hope to always be your favorite yanks.